I like to paint the oozy goozyness of life. 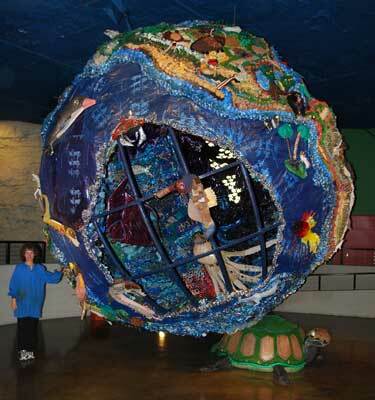 The Globe of Found Objects is a 16'(4m) diameter rotating sculpture of the earth located at EarthWorks - KC. 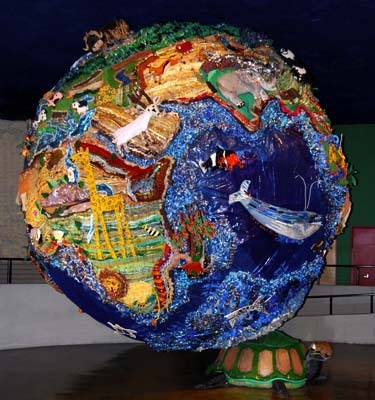 (www.ecewkc.org) This 1996 community collaboration was designed and built by Holly Hughes with the help of 2000 volunteers, including artists from 17 countries. It is made entirely of recycled items. Story and more pics on Hollys' Bridge Homepage . SUPPORT the building of this website and the long term cleaning and maintenance of the Globe by purchasing GLOBE posters, notecards and postcards available in 'Photos & Prints' album to left.